Welcome to Greeley Youth Lacrosse, the fastest game in town! Greetings from the Greeley Youth Lacrosse Association! Registration for grades 3 – 6 will remain open until Friday, January 5th, 2019, with the exception of 7/8 Boys and 7/8 Girls, which is now closed. 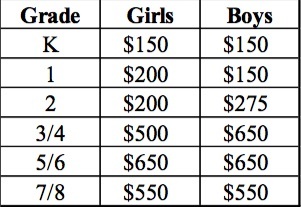 Registration for grades K – 2 will remain open throughout the end of the spring lacrosse season (May 30th, 2019). As you may already know, we have combined the team in grades 3/4, 5/6, and 7/8. There is a sibling discount of $50 per additional child in each household. The fees do not include the cost of the uniform. We are looking forward to another great season this spring… thanks for your support of Greeley Youth Lacrosse! Call the weather hotline 914-238-2540 to determine status of fields!